This might be bittersweet to some of you. It is to me. Over recent months, EA has been a hot topic in the video game community, and not in a good way. With their failed release of the new Sim City and their customers not being treated well, I’d imagine a lot of us will be less than thrilled about this. 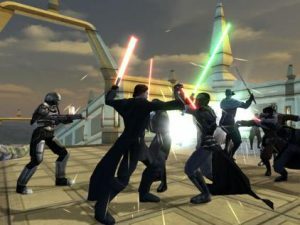 But EA Games has teamed up with Disney and ‘Star Wars’ to release video games exclusively under their banner. It also looks like EA is looking for suggestions from the masses on what kind of games we would want to play in the ‘Star Wars‘ universe. In addition to distributing games on gamer consoles like the new XBOX and PS4, which are set to debut later this year, EA will release ‘Star Wars‘ content on mobile devices as well. So will we get a “Tapped Out’ game of Star Wars like we have seen with The Simpsons? Only time will tell. I love that line. It instantly transports me back to my childhood, to an epic world that had a powerful influence on my life. Like hundreds of millions of people, I am a true believer – someone who can’t get enough of the story, the culture, and the ethos of Star Wars. While we don’t have any details to share today on specific titles, our development teams are already brimming with design ideas. The EA Studios that will develop these games are some of the most innovative and popular creative teams in the world, and include DICE and Visceral, in addition to the BioWare team, which is already developing for the Star Wars franchise. These imaginative teams will make games that may borrow from films, but the games will be entirely original with all new stories. Powering it all will be the Frostbite 3 development engine – guaranteeing incredible graphic fidelity, environments and characters. We have lots of ideas, but we want to hear from you. Tell us what kind of games you want to play. Send us your suggestions and tag @EA_DICE @VisceralGames @BioWare and #starwarsnextgen. This entry was posted on Monday, May 6th, 2013 at 4:35 pm	and is filed under Film, News, Video Games. You can follow any responses to this entry through the RSS 2.0 feed. You can skip to the end and leave a response. Pinging is currently not allowed. My favorite Star Wars games were always the flying ones. More of that would be great! « ‘American Psycho’ Is Slicing Its Way to the Stage as a Musical! !